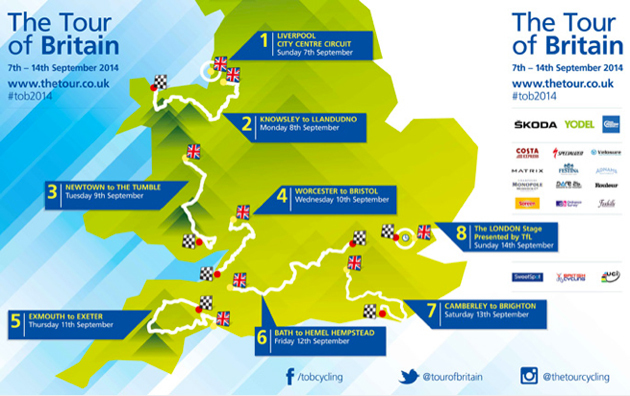 The 2014 Tour of Britain kicks off on Sunday 7th September in Liverpool with a world class line up of riders. Some of the biggest names in the sport will be lining up alongside the cream of the UK based professionals for what looks to be one of the best editions of the race ever. 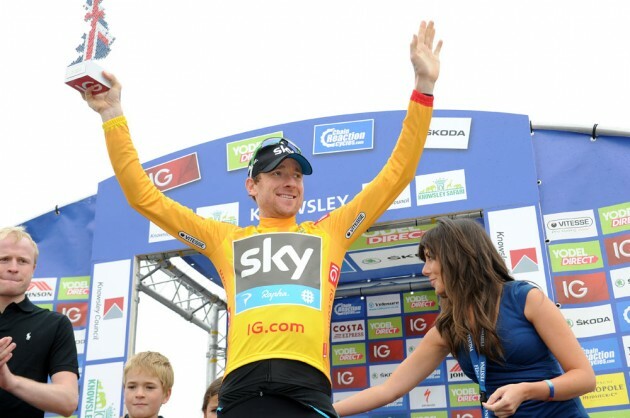 The stand out favourite for the overall victory is last year’s winner and British treasure Sir Bradley Wiggins (Team Sky). Wiggo is out to defend his title and build up towards the world time trial championships and has brought a strong Sky squad to support him. He’s had some strong showings this year with 9th in Paris-Roubaix but more importantly for this race, a victory in the weeklong Tour of California in May. 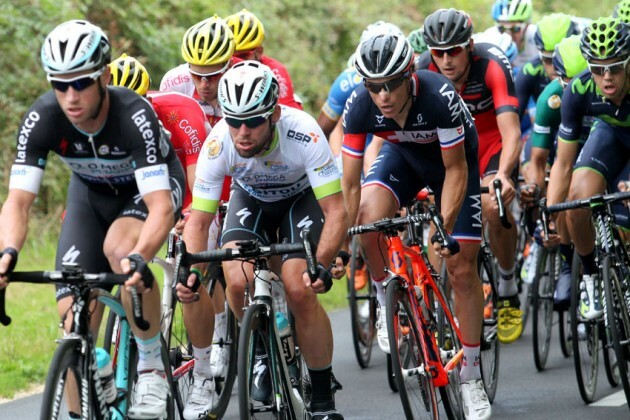 Following his omission from this year’s Tour de France which started in Yorkshire, the Tour of Britain provides Wiggo with a chance to show his class and for the British public to see their hero on home roads. Apart from the first and last stages which are nailed on bunch sprint finishes, the route is hilly and with only a short time trial on the last day, anyone in the lead will have to be very attentive the entire race. Sylvain Chavanel (IAM Cycling) – known for his attacking and never say die attitude, expect to see him light up the race whenever he can and take any advantage and exploit to the full for the win. Leopold Koenig (Team NettApp-Endura) – Achived top 10 finish at this year’s Tour de France in his first attempt, hilly course will suit him but maybe not the short overall duration. Steve Cummings (BMC) – English rider is leaving BMC at the end of the season and will be out to prove himself. Has won short stage races before and will be fired up to do well in a rare appearance on home roads. This battle between the sprinters is the one we’re most looking forward to. There may be only two pretty much guaranteed bunch finishes (first and last stages) but what a showdown it will be. Current sprint King Marcel Kittel (Giant-Shimano) has proved himself to be the fastest man on two wheels this year and will be keen to keep that record intact. British favourite Mark Cavendish (Omega Pharma-Quickstep) has recovered from his Tour de France crash and has already won several stages in the Tour du Poitou Charentes. He’ll be keener than ever to win the sprints and prove he is still the sprint king and if he can get the better of Kittel it will set him up well for future races. Recent London-Surrey Classic winner Adam Blythe (NFTO) is on a winning streak and will be very interesting to see how he fares against the two biggest names. Irish rider Sam Bennett (Team NetApp-Endura) has had an impressive first year in the paid ranks and shown himself to be a canny sprinter so will be good to see how he fares in such illustrious company. The short 9km individual time trial around the streets of London on Sunday 14th September offers a great battle between Wiggins and former multiple British TT champion Alex Dowsett (Movistar). Tinkoff–Saxo bring a strong team with Irish rider Nicholas Roche, son of former Tour de France winner Stephen, team leader on a course which suits his aggressive attacking style. Ben Swift (Team Sky) has also had a good season and has been knocking on the door for stage wins often just falling short at the line, will definitely be in the mix in the sprints if he’s not too knackered from helping Wiggins for the overall. The home teams as well as the young GB Team will be keen to get some exposure for themselves and their sponsors so expect at least one of them to be in the breaks everyday and up there in the combativity and climbers awards. The Friends Life Yellow Jersey – overall classification leader. 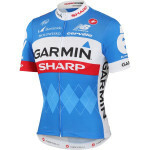 Chain Reaction Cycles Points Jersey – points classification leader. Tagged pro, pro cycling, pro racing. Bookmark the permalink.